Bank account details of potentially thousands of Britons are being sold in West Africa for less than £20 each, the BBC's Real Story has learned. The information is contained on the hard drives of personal computers exported to Nigeria, along with thousands of pages of other confidential material. Hard drives - the devices that computers use to store all sorts of data - are very easy to get hold of and there is a genuine market for people upgrading their computers with our cast-offs. Some 23,000 tonnes of electronic waste, the equivalent of about 750,000 computers, is flooding out of the UK and into the developing world every year, according to the Environment Agency. 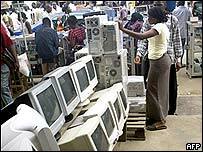 They end up in computer markets in cities such as Lagos, Nigeria, where you will find second hand parts of PCs from Britain and all over the world. The problem comes when someone with a criminal mind accesses the information that is stored on this hard drive. "Once you let your computer go away, your so-called personal computer is no longer personal, it becomes very public," said environmental campaigner Jim Puckett. A single hard drive can have thousands upon thousands of pages of extremely personal information. Real Story bought 17 hard drives from Nigeria at £15 a unit and, using a computer forensic expert, traced the original owners of the computers. We found home addresses, bank account numbers, sort codes, passwords, emails that had been sent - highly confidential information relating to people's businesses. If you wanted to, you could do a lot of damage with this material. With one PC, the programme traced Ted Roberts from Essex. He says he dropped off his PC at a council recycling point at a local tip. He was concerned that we managed to retrieve details relating to his family, car and even his bank account from the drive. "I am absolutely gob smacked that information has come off a computer in Nigeria," he said. "It worried the life out of me to be honest and I only use it for normal daily things like letters and bits and bobs." "But what it has done is created a whole picture of my private life and I think that's unforgivable." Essex Council did not want to take part in an interview but in a statement they said they had not acted illegally and therefore there was no case for them to answer. The council strongly advises people to remove all data from their hard drives before disposing of their computers. They went on to say that people should continue to use council channels when recycling their PCs. Real Story: BBC One, Monday, 14 August, at 1930 BST.